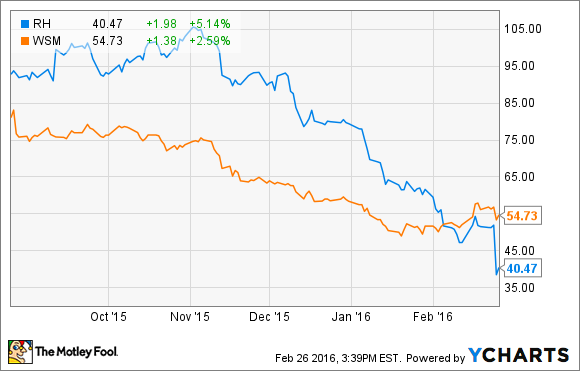 Is Restoration Hardware a Broken Stock? Shares nosedived after a terrible earnings report. Is there any hope for a recovery? Shares of Restoration Hardware (NYSE:RH) hit the deck last week after the company released a disastrous preliminary earnings report. The upscale furniture retailer said that earnings would come in at just $0.99 per share, down from $1.02 a year ago and well below the analyst consensus of $1.35. The stock finished down 26% as quarterly revenue of $647 million was also badly off estimates of $708 million. CEO Gary Friedman cited three factors for the slowdown. First, he noted that orders had increased 21% in the quarter but revenue was only up 11%, and blamed shipping delays and vendors struggling to ramp up production for the new RH Modern line for the disparity. Second, he blamed low oil prices and a strong dollar for squeezing sales in Canada, Texas, and Miami, which he said shaved 4% off the company's top line, and lastly, that promotional sales were not a successful as usual. Friedman believed the results were affected by volatility in the stock market and changing market conditions that scared off the high-end consumer. "Historically, our business has a correlation to large movements in stock prices as we believe asset valuations influence our customers' buying patterns," he said in the release. A handful of analyst downgrades followed the report as Restoration stock had already been in trouble, losing half of its value since the beginning of November on concerns about slowing sales growth and a recession. Investors were unimpressed with the prior third-quarter report as revenue also came in short of estimates. The stock had soared through its first years on the market, tripling in value from its 2012, but it just gave back those gains in a matter of months. Is this a broken a company, or can Restoration Hardware bounce back from this sudden challenge? Analysts have also blamed the stock's recent slide on the reverse wealth effect, or the reluctance of wealthy shoppers to spend as their stock portfolios lose value. Restoration Hardware's closest publicly traded rival is probably Williams-Sonoma (NYSE:WSM), which own its namesake chain of home furnishing stores as well as Pottery Barn and West Elm. As you can see from the chart below, Williams-Sonoma shares have also fallen lately, though not as sharply as Restoration Hardware's. Williams-Sonoma hasn't reported fourth-quarter earnings yet, but its third-quarter guidance was weak, indicating that the trends Friedman cited are real and not just a challenge for Restoration Hardware. There are other signs that Restoration Hardware's rapacious growth is slowing dramatically as well. For full-year 2015, comparable brand revenue grew by 11%, down from 20% the year before. For the four years to 2014, its lowest rate was 26%. While 11% comparable growth would normally be impressive for the company, Restoration Hardware has been transitioning from a mall-based retailer to opening lavish showrooms as its store count has gone down from 91 to 67 between 2010 and 2014, even as its selling space has more than doubled. That strategy has helped drive consistent sales and profit growth, and the company last year launched brand extensions including RH Modern and RH Teen, which should help boost growth. According to the recent report, the initial response to RH Modern has been "outstanding," and the company plans to improve its supply chain and expand the product selection this year. Friedman has shown an instinct with the brand before, rescuing it from near-death during the recession by rebranding it and making it more upscale. While the stock may take a breather this year with the market in flux, it's too early to call it broken. With RH Modern just rolling out and the company opening more trademark showrooms, Restoration Hardware is aggressively positioning itself for the future. The stock should regain its footing when the market calms down.